Deputy Editor-in-chief – Getman Anatolii Pavlovych, Doctor of Legal Sciences, Professor, Academician of the National Academy of Legal Sciences of Ukraine. Collection was founded in 1976. Publication frequency – 4 times a year. Language of edition – Ukrainian, English, Russian. ISSN 2224-9281 (Рrint), ISSN 2414-990Х (Оnline). Collection is registered with the Ministry of Justice of Ukraine – the Certificate of State Registration of print media: Series КВ No. 21387-11187 ПР, 17.06.2015. Collection is included into the List of Refereed law scientific publications of Ukraine – Оrder of the Ministry of Education and Science of Ukraine No. 1021, 07.10.2015. Collection provided DOI (doi: 10.21564 – Digital Object Identifier) to articles from 2015. Contacts: Yaroslav Mudryi National Law University, Editorial and Publishing Department of Scientific Publications, Pushkinska st., 77, Kharkiv, 61024, Ukraine, tel. +38057 704-92-99, e-mail: problzakon@ukr.net. I am glad to greet you on the website of collection of scientific works «Problems of Legality», which has been published by Yaroslav Mudryi National Law University for about 40 years. Updating of the legal system of Ukraine is caused by the globalization of international life, the need for increasing of role of an individual in the modern society, the recognition of a human being as the highest social value, priorities in protection of the rights and freedoms, embodied in the political and legal practice of the rule of law, formation of a socially oriented market economy. This is what defines the role and importance of the collection of scientific works «Problems of Legality», which main objective is achievement of a new level of completeness and efficiency of satisfaction of the informational needs of society in knowledge in the field of law, promotion of its progress; development of general theoretical issues of law-making and law enforcement under conditions of formation of a law-governed state; study of actual problems of history of Ukrainian national state building, theory and practice of state law of foreign countries and international law; coverage of theoretical principles and applied aspects of activity of state authorities and local self-government bodies under conditions of development of civil society. The collection contains scientific articles on actual problems of jurisprudence: theory and history of state and law, constitutional and state construction, civil, labor, financial, economic, administrative, customs, environmental, criminal law, criminal and civil procedure, criminalistics, issues of combatting crime etc. 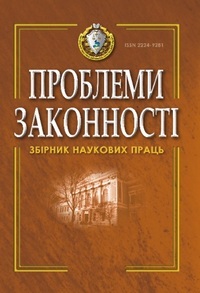 The Collection is registered with the Ministry of Justice of Ukraine (the Certificate of State Registration of print media: Series КВ № 21387-11187 ПР of 17.06.2015), is included in the list of scientific professional editions, where the results of theses for a Doctor’s and Candidate’s degree in Legal Sciences may be published (Order of the Ministry of Education and Science of Ukraine № 1021 dated 07.10.2015). The policy of the collection exchange provides for exchange of scientific, theoretical and practical developments on actual general theoretical and sectoral legal issues, law enforcement practice by representatives of Ukrainian and foreign legal science, serves as a consolidation of efforts and coherence of actions on the domestic, interstate and international levels. We hope that the collection of scientific works «Problems of Legality» in the context of the interaction of all branches of law, as well as taking into account the experience of foreign countries, will contribute to the development of domestic legal science, modernization of legislation, activity of law enforcement, regulatory bodies and institutions, building a law-governed democratic state, formation of a national legal system. An accordance with the order of the Ministry of Education and Science of Ukraine dated January 15, 2018, No. 32 "On Approval of the Procedure for the Formation of the List of Scientific Professional Publications of Ukraine", the Expert Council of the Ministry of Education and Science of Ukraine on examining dissertation papers on legal sciences on 06.02.2019 reviewed submitted by Yaroslav the Wise National Law University documents on the collection of scientific works "Problems of legality" and recommended to include it in the new List of scientific professional editions of Ukraine as legal professionals in the category "B". • the fourth issue: November, 15 (posting on the site – December of the current year). 144 was published issue of the magazine. Copyright version is available in the room 412.